The City of New Orleans has issued a Request for Quotation to lease the management of the New Orleans Public Belt Railroad in what is being referred to as a public/private endeavor. Last Wednesday, February 1, 2017, a mandatory pre-bid conference was hosted at City Hall by Ryan Berni, Deputy Mayor of External Affairs for CNO and the mayoral appointee to the NOPB commission. Also present were representatives from KPMG, the firm hired by the City (independently of the Commission) to conduct the evaluation which led to the RFQ. New Orleans Public Belt Railroad Pre-Bid Conference PPT. There was a brief question and answer session following the Powerpoint presentation but Berni informed the group that any questions could be submitted to the City's website where they will be publicly answered in an effort to maintain transparency. He also stated a "cone of silence" has been issued for the NOPB staff and Commission through the RFQ process. I have personally tried to contact the KPMG members heading up the evaluation but I got no response via email. I am assuming they are subject to the City's cone of silence as well. 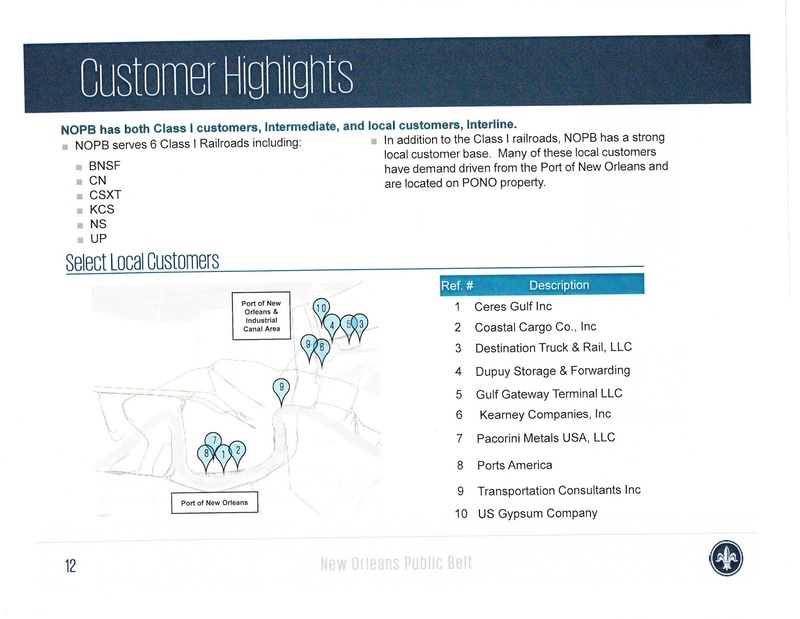 Many of the questions posed surrounded the complicated contracts and labor agreements the NOPB holds with Class 1 railroads, the NOPB union workers and the Port of New Orleans. In specific, the labor agreement with the Union was brought up more than once. Berni stated that the City was focused on keeping as many local jobs as possible but that doesn't seem likely if a private company takes over the management of NOPB. The labor agreement seemed to be a point of concern among the prospective buyers, it will almost certainly be on the chopping block if the lease goes through. Another question which arose was the exact nature of the partnership between the City, the NOPB and the prospective partner. Berni stated that the City is looking for a partner to lease the "operation and asset management transfer" of the NOPB. This subsequently brought up the issue of the property tax exemption the NOPB now enjoys as a public entity and how that would affect the new management entity. Berni replied that "different assets will be attributed differently" in respect to property tax exemption. Probably the biggest question mark with the RFQ is the nature of the current agreement the NOPB has with the Port of New Orleans. Right now, because the structure of the NOPB is designed to solely serve the Port (not necessarily generate a profit), the Port has a $1/year lease agreement with the railroad. If a private entity takes over the NOPB, that agreement will most likely be renegotiated...if the Port even chooses to do business with the new entity. There was no clear answer from the City on how the Port and other issues would play out but Berni stated later in the meeting the City was looking for the applicants to propose solutions to the management challenges in their quotes. The unknowns of the Port contract along with the complicated trackage rights issues with Class 1 railroads are going to make any proposal by the private bidders somewhat of a challenge. One other issue that struck me personally is that there are no safeguards for the existing Port vendors who utilize the NOPB. Berni did state they expect the prospective bidders to be "focused on local customers as opposed to third party entities" but it's not clear how the City would enforce that intent, especially after the current administration exits the stage. 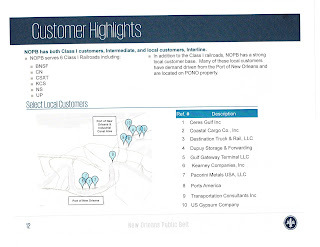 Page 12 of the Powerpoint presentation highlights some of the select transportation and storage warehouse companies who depend on the NOPB. The multi-million dollar question is how a private entity taking over the NOPB will disrupt, undercut or even bankrupt these existing local businesses. There is no non-compete clause or provision for the prospective manager of the railroad mentioned in the RFQ so the private partner could theoretically build their own warehouses and competing business to cannibalize some or all of the existing businesses in this slide. In previous posts, I documented some of these business owners' objections to the privatization of the NOPB as well as this RFQ that was just issued by the City. As of now, the City is planning on choosing a preferred bidder on June 23, 2017. However, the acceptance of a bid does not guarantee the NOPB Board of Commissioners approving the private/public partnership. They did vote to research the possibility of the lease but they haven't voted on approving a lease as of yet. That factor wasn't brought up in this pre-bid conference but it will have to occur at some point....the Powerpoint schedule states board approval would take place in the Summer of 2017 after the preferred bidder is chosen by the City. Coming up, I will take a closer look at the Port's relationship with the City and the viability of public/private partnerships the City of New Orleans has executed in the past. As always, email me with any questions or use the comment section. If I'm a Class 1 RR hoping to do an end run around the public pushback against the proposed New Orleans Rail Gateway, count me in for this unfettered takeover! And thank Mitch for serving this cheap alternative on a silver platter!! Why do you think Mitch would offer this "cheap alternative" to a Class 1? Not sure I understand your theory. Saying the city makes $0 off the NOPB is disingenuous considering the entity was never designed to trim a profit or generate much net directly to the City. It was created solely to serve the Port which in turn creates tremendous revenue for the City and region. If the City is truly hard up for a $20 million payout and $1 million a year, I can name about 5 ways off the top of my head they could generate that money simply by enforcing existing contracts, ordinances and taxes. I, personally, do not think the impetus for this is such moly to generate more cash for the City. On phone, sorry for typos and spellcheck. That's what I thought you may have meant but you worded it in a rather pretzel way. The most interesting names on the sign-in list are Suntree Capital and... Fortress Investments. FIG is making a heavy play into owning public services (see here https://www.nytimes.com/2016/07/15/business/dealbook/private-equity-influence-fortress-investment-group.html). You can bet they'll slice Public Belt up, kill the union, and jack rates to the moon. Maximizing the various transaction uncertainties helps maximize the windfall profit possibilities for a well connected bidder. The public interest gets boned under all likely eventualities. Is there excess railroad real estate to dispose of? (RF&P Potomac Yards Redevelopment). Who gets stuck with the legacy environmental liabilities? By the way, Greg Meffert was released from prison today. Who turned in proposals to run the railroad? Do you know.